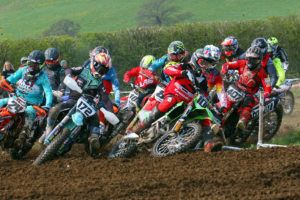 The Bridgestone British Masters Motocross Championship got its season underway at the second time of asking at Culham at the weekend, and with packed line ups in every class, the heat was well and truly on as all of the racers had their eyes on 2019 title glory. Jake Millward is in stunning form this year and continued that with the fastest Pro qualifying time, and he continued this speed in Moto 1 by taking the Pro MX1 class win by a slender margin over Jake Shipton and the hard-charging Ryan Houghton. With the race called with 15 minutes on the clock due to the Red flag being applied, any attempts for the win by Houghton, 4th placed Dan Thornhill or Elliott Banks-Browne who was showing speed in 5th was halted. At the start of Moto 2, the top two riders in last years champs, Houghton and Banks-Browne were involved in a pile up with EBB retiring and Houghton cruising round to collect points. Shipton was on a mission though and rode a stormer for the win ahead of the smooth Thornhill, Brad Todd, and comeback man Luke Norris. Millward was back in 5th, meaning the overall went to Shipton, from Thornhill and Millward. In the Pro MX2 class Ashton Dickinson fired from the start in race one and looked good at the front but the Yamaha duo of Taylor Hammal and Martin Barr were on his case. With the race being put back a lap it meant the finishing order would be Dickinson, Barr and Hammal, with Hammal losing the position he gained over Barr. In race 2 it was Barr out in front, but once again Hammal was showing raw speed and closing in after a poor start. It was Barr who takes the chequers eventually from Hammal, with these two taking the same positions in the overall pecking order with Dickinson down the order after failing to score in the second moto. Liam Knight would finish third in the second race and overall, with Matt Burrows fourth in the standings, ahead of Carlton Husband fifth. While the Pro’s just raced the Sunday the rest of the classes pitched up for a two day battle of motocross wit the smallest racers being the 65 Juniors. Brandon Buckley rode like a hero to take the honours in this class with three race wins, over Noah Eastwood who put in a great perfomance in second and Charlie Richmond third. Freddie Gardiner had a Saturday to forget but on the Sunday he showed his talent with a second and a race win which was enough to elevate him to 4th overall. Ben Mustoe looked in total control for the Small Wheel 85 win, but a puncture in the final moto put pay to his chances of an overall which went the way of Will Haddock who put in a great shift all weekend long. Mckenzie Marshall racked up solid points in each moto for second with Tyla Hooley saving his best for last winning the fourth and final moto of the day which secured him the number 3 spot on the podium. Sam Atkinson was the king of the Big Wheelers powering to all 4 race wins in scinilating fashion. Behind Atkinson results were all over the place in this highly competitive class and it was Tye Jones who would fend off his rivals for the number two spot just three points ahead of Arai Elcock in third. Ike Carter is a name we are hearing tons about in 2019, and he showed why by notching up three moto wins and the victory in the MYX2 Youth group. Kyle Mcnihcol would lower Carters colours in the opening race and would finish second, with Todd Leadbitter third. The racing in the 125cc class is out of the top drawer, and it was Chris Povey who was the king of the 2 smokers seeing off the fierce challenge of Troy Willerton for the win. This pair would share race wins, with two apiece and when the points were counted it was Povey who nudged the win by two points, but we get a feeling this is a battle that will rage all season long. Jordan Bachelor finished a great third, and with a host of fantastic talent behind him too, in what is going to be one of the classes to watch in 2019. Greg Fisher was victorious in the Clubman class winning both Saturday motos, with Charlie Sutton and Mark Kinsley, claiming the race wins on Sunday and second and third overall respectivley. It was a dominating performance by Luke Sturgeon in the Amateur MX1 group, blitzing the field for a complete set of 4 wins from Gareth Artus in second and Adam Day in third. Oliver Benton would seize the day in the Amatuer MX2 class, with a trio of race victories and the overall, ahead of race two winner Jack Rowland in second and George Clarke third. The series now heads to Wroxton for round 2 on the 11th and 12th May.